A package found in west London at the weekend may have been a fifth bomb intended for last Thursday's attacks. Police carried out a controlled explosion on the package found on Saturday in bushes in Little Wormwood Scrubs, a park not far from the prison. The BBC's Daniel Sandford said: "It does look as if that was planned to be a fifth bomb for use last Thursday." It may mean a fifth bomber is on the run. Police have CCTV pictures of four suspects from Thursday's failed blasts. Three Tube trains and a bus were targeted on Thursday, two weeks after suicide bombers killed 52 people in a series of explosions. Warren Street, Shepherd's Bush and Oval Tube stations were evacuated between 1225 BST and 1245 BST after reports of a bang and the smell of smoke. An hour later the driver of a number 26 bus to Hackney Wick heard a bang on the top deck and found a rucksack had exploded and blown out the windows. No-one was seriously hurt. More than 500 people have contacted police after CCTV images were released of four men police believe are connected to the failed attacks. But Scotland Yard has confirmed none of the three men being held under the Terrorism Act are the four men featured in the pictures and a major manhunt is still under way. Home Affairs correspondent Daniel Sandford said the package found in bushes in Little Wormwood Scrubs appeared to be a similar design to those used on Thursday, with explosives, nails and shrapnel. "It does look as if it was a fifth bomb, a bomb of very similar design to one of those used on Thursday, one of those that failed to go off. "The police feel they may now not be looking for four bombers, but for five bombers." Searches are continuing and the area is still cordoned off. 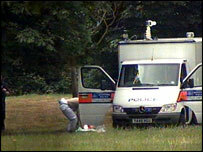 Anti-Terrorist Branch chief Peter Clarke said: "The object appears to have been left in the bushes, rather than hidden. "Naturally this is a matter of concern, and I would urge the public to remain vigilant and to report any suspicious items or activity." Police want anyone who saw anything suspicious around the park to call the anti-terrorism hotline, which they are also asking Londoners to store in their mobile phones.